Stora Saluhallen is one of Göteborg's biggest attractions for us foodies. It is by far not less impressive than its counterparts in Italy, France, and Spain. Here you may wander along stalls offering beef, poultry, dairy-products, seafood, vegetables and sweets prepared after different culinary traditions. Sweden as an international community is clearly visible here, but all products I saw looked fresh, home made and of high quality. I will guide you through a little of Saluhallens history and character. More stories of what to buy here will come up later on Enjoy Food & Travel. 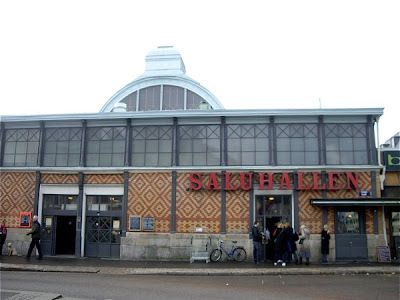 When you enter Stora Saluhallen, you are struck by its similarity of a large railway station. 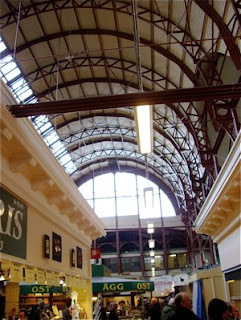 It is a large hall with a curved ceiling held up by iron structures. Kungstorget, the square where Saluhallen is located, was the main market where the citizens of the city were offered meat, cheese, butter and flour from 1848. In 1850 a crescent shaped bazaar building was constructed and it was in use until 1966, when it was torn down. Stora Saluhallen was designed by architect Hans Hedlund and was finished 120 years ago. Göteboks Mekaniska Verkstadsaktiebolag was in charge of the construction. I was opened February 1st 1889. When you enter you will find 4-5 rows of stalls separated by passages. Here you may go to buy traditional Swedish products as well as those made in Continental Europe, North Africa, Turkey and the Middle East. And as elsewhere in Europe, you may enjoy something to eat either in restaurants as Till Salu or Kågebaren, or do as we did, enjoy an Italian espresso balanced by a piece of sweets. COMING UP: The following food stories from Saluhallen on Enjoy Food & Travel. A story of ham, bacon, and sausages prepared after different culinary traditions. Offering a wide range of mouthwatering high quality products from Italy, including the most exquisite parma ham. Foreign and domestic cheeses and French butter! 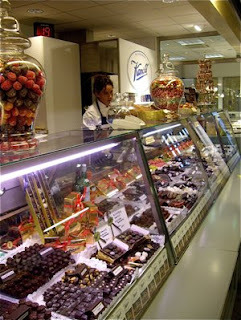 Chocolate producers since 1901 with a very impressive range of truffles with the most unusual flavouring. 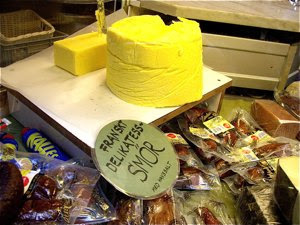 A very unusual ingredients loved on the continent but nearly not heard of in Scandinavia.